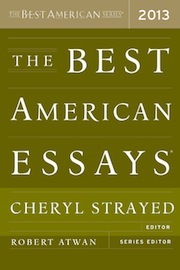 Last year around this time I mentioned my fondness for the annually appearing Best American Essays and my particular pleasure in noting that, each year, more and more of the essays in this anthology address medical topics. Eight out of twenty-four of the essays selected for inclusion last year dealt with illness or the body. This year's volume, edited by Cheryl Strayed (author of the best-selling memoir Wild) features fourteen medically themed essays--more than half! Mental illness is a particularly common subject, as is pregnancy. Here's a list of those fourteen essays with links, where available, to the original publications in full or excerpt. Happy reading--and happy holidays! "Night" by Alice Munro. The winner of the 2013 Nobel Prize in literature recalls a childhood bout with appendicitis which aroused deep feelings of sibling conflict. "Night" is included in Munro's most recent book, Dear Life, which she has said will be her last. "Highway of Lost Girls" by Vanessa Veselka. A woman wonders if the creepy truck driver who picked her up when she was hitch hiking in the 1980s was actually a psychopathic serial killer on the loose then. Okay, maybe a stretch to call this medical...but such a good essay. "My Father's Women" by Mako Yoshikawa. After the death of a Princeton physicist who suffered from manic depressive illness, his daughter looks to her father's wives and girlfriends for evidence of his capacity for love. "'I'm Jumping Off the Bridge'" by Kevin Sampsell. When a customer threatens suicide, a bookstore worker re-examines his own life. "Pigeons" by Eileen Pollack. A woman recalls her evaluation by a school psychologist at age eight. "Triage" by Jon Kerstetter. A physician treats the wounded in Iraq. "The Art of Being Born" by Marcia Aldrich. A woman tells her child about that child's birth, and recalls her own darker birth story as well. "What Happens in Hell" by Charles Baxter. An accident during a limo ride to the airport provides a violent preview of death. "The Girls in My Town" by Angela Morales. A young teacher and mother writes of the pregnant teens in her community. "When They Let Them Bleed" by Tod Goldberg. A man recalls his childhood during the golden age of boxing in the 1980s, and a boxer who died in the ring from a blood clot on the brain. "Field Notes on Hair" by Vicki Weiqi Yang. A meditation on hair loss during cancer therapy. "Channel B" by Megan Stielstra.A woman struggling with post-partum depression finds a surprising source of comfort: an interfering signal on her baby monitor. "Epilogue: Deadkidistan" by Michelle Mirsky. A pediatric hospital worker recounts the aftermath of her young son's death from cancer. "The Book of Knowledge" by Steven Harvey. At sixty-one a man revisits the encyclopedia he read as a child, as well as the letters of his mother, who committed suicide when he was twelve.